In this form Durga is two-armed, clad in white and carries a rudraksha mala and sacred Kamandal. She is in a highly pious and peaceful form or is in meditation. This form of Durga is related to the severe penance undertaken by Sati and Parvati in their respective births to attain Lord Shiva as husband. Some of the most important Vratas observed in different parts of India by women is based on the strict austerities followed by Brahmacharini. 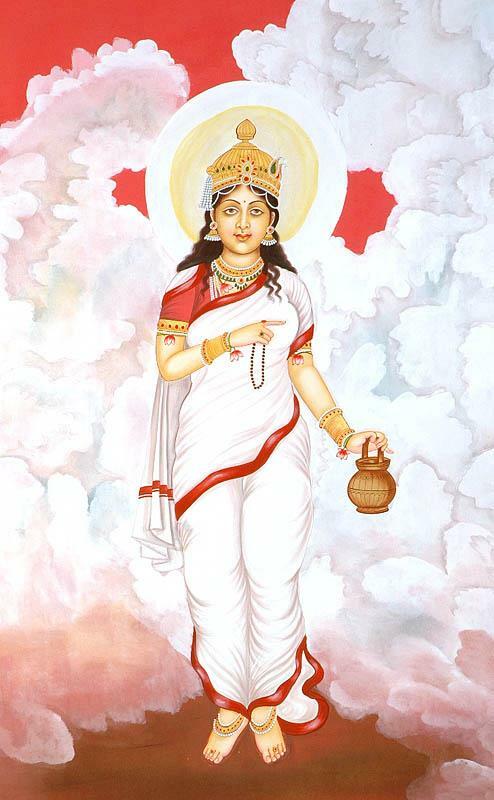 She is also known as Tapasyacharini and is worshipped on the second day of Navrathri. Having immolated herself in the sacrificial fire, Sati was born of Maina as a daughter to the Mountain-King Himalaya. Keeping in view her auspicious traits, she was given the name of ‘Parvati’. When she had grown up into a beautiful maiden, the celestial sage Narada while roaming about happened to reach the court of king Himalaya. Sage Narada was warmly welcomed by the Lord of mountains. Thereafter Himalaya and Maina prayed to Sage Narada to predict the future of Parvati by reading her palms. Sage Narada agreed to their request. Seeing Goddess Parvati, Sage Narada stood up and bowed to her with great reverence. The mountain-king Himalaya and queen Maina were amazed at such an unusual behavior of Sage Narada. They were curious to know the cause of this unique behavior. Thereupon he spoke with a smile, “O Lord of Mountains! This daughter of yours in her previous birth was Sati, the daughter of Daksha and the consort of Lord Shiva. Having listened to the prediction of Sage Narada, Goddess Parvati inquired of him how to beget Lord Shiva as her consort. Thereupon Sage Narada advised her to perform an austere penance. Acting upon the advice of Sage Narada, Goddess Parvati renounced all the pleasures of the palace and started performing penance to beget Lord Shiva as her husband. She spent the first thousand years of her penance by living on fruit and roots. Thereafter she lived on leaves for another three thousand years of her penance. Then she lived on water and then air alone braving heat and cold, rain and storms and all kinds of sufferings. Goddess Parvati meditated on Lord Shiva for thousands of years. The austere penance performed by her reduced her to a mere skeleton. A great hue and cry prevailed in the three worlds because of her severe penance. All the Gods including Indra and Saints and Sage were terrified by her penance. They approached Brahma in a body and prayed to him to bestow the desired boon on Parvati. At last Brahma, appeared before Parvati and said to her, “O Goddess! All the Gods bow to you in deep reverence. Such an austere penance can be performed only by you. Your cherished desire shall soon be fulfilled. You shall beget Lord Shiva as your consort. By virtue of this austere penance you shall be known as “Brahmchaarini” – a woman of celibacy. Thereafter Brahma restored her physical charm and grace. Thus Goddess Parvati begot Lord Shiva as her husband by virtue of her penance. She earned the reputation of being a Brahmchaarini. The worship of Maa Brahmchaarini is conducive to penance, renunciation, virtue and nobility. Her devotees are endowed with peace and prosperity.